My teacher read us "A Wrinkle In Time" when I was in the seventh grade, about 1980. At the end of this book, there was one chapter from another book, sort of a promotional sample. It featured a fantasy warrior of some kind, standing on a plain, looking at an immense giant blob, a translucent wall that contained the half-digested remains of many other warriors, their armor and their weapons, spears and such. I always wanted to read that story, never found out the name. Ring any bells? (Since it was at the end of the L'Engle book, I thought it might be by the same publisher Farrar, Straus and Giroux, but I don't know how to research it). 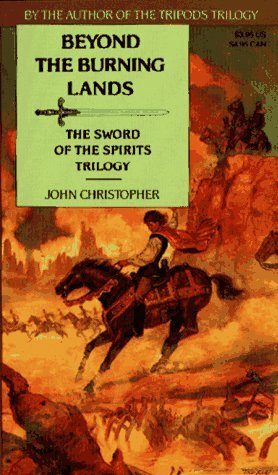 Could this be Beyond the Burning Lands, the second book in the Sword of the Spirits trilogy by John Christopher? I looked over the ruins to the next rise of ground, and saw the Bayemot. Except in size it was something like the bubbles of jelly that make up frog spawn. But it was almost as high as three other men, one above the other, and being flattened from a true sphere by the earth's pull was even greater in breadth. It was motionless but quivered, although the wind had dropped, and though it was nearly transparent there were darker shapes within. I saw, or thought I saw, an arm feebly press against the jellied horror which bore it down.